It took awhile, but fly reel manufacturer and creative machine shop Abel Automatics, Inc. has streamlined, modernized and perfected the ubiquitous tool found on virtually every fly fisher’s vest: the zinger. Used to hold nippers, clippers, de-barbing pliers, fly floatant, scissors or magnifying glasses – to name a few – within easy reach on a retractable spool, the tools have been most notable for breaking or falling apart at the most inopportune time. 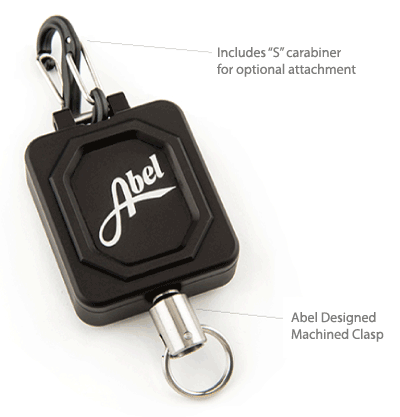 Abel’s made-in-the-USA Zinger boasts stainless steel and 6061-T651 cold finished aerospace grade aluminum construction and is designed with the option to either attach to a vest using a screw mechanism or utilize the included “S” carabiner to clip it to a D-ring on a vest or sling pack. The 36-inch retracting cord is manufactured from a spectra-nylon blend with 40-pound test strength, ensuring an angler’s ability to reach wherever it is needed without breakage – the number one complaint with plastic “bargain” retractable spools.